The Philadelphia Convention & Visitors Bureau (PHLCVB) has announced that it will participate at TravMedia’s International Media Marketplace 2019 on 25 March 2019 at London’s QEII Centre in Westminster. TravMedia’s International Media Marketplace is celebrated as the travel industry’s leading event for the media to meet travel and tourism brands and the day will provide Philadelphia CVB with the opportunity to share news on the East Coast city’s exciting tourism developments planned for 2019 as well as network with key travel journalists, editors and broadcasters. The World Heritage City of Philadelphia has celebrated several new developments for visitors in 2018, including the opening of an elevated 25,000 square-foot Rail Park, which sits on top of the former Reading Railroad viaduct, and a $22.5 million transformation of the historic Bourse exchange building into a food marketplace, which is expected to open in late 2018. 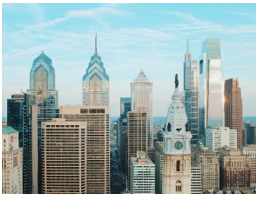 In early 2019, the city will also welcome the luxurious Four Seasons Philadelphia, which will offer guests 360-degree views of the city from the top of the new 60-floor Comcast Technology Center, the tallest building in the city. In mid-2019, Starwood’s new dual-branded W and Element Hotels property will open and later in September 2019, Philadelphia will also see the opening of Fashion District Philadelphia, which will allow travellers to indulge in the city’s tax-free shopping across three blocks of retail, dining and entertainment space. According to recently released data from Tourism Economics, Philadelphia welcomed a total of 648,000 overseas visitors in 2017, which represents an increase of 9% over the last five years. Top feeder markets to Philadelphia came from Western European countries, including the UK, and the Asia Pacific region. Image 1: Philadelphia’s skyline. Image courtesy Kyle Huff for PHLCVB. Philadelphia Convention & Visitors Bureau (PHLCVB), www.discoverPHL.com, a private non-profit membership corporation, is the official Tourism Promotion Agency for the City of Philadelphia globally, and the primary sales and marketing agency for the expanded Pennsylvania Convention Centre. The PHLCVB competes with its counterparts worldwide for convention and tourism business. The organization has divisions dedicated to the multicultural, sports, and life sciences markets. This entry was posted in News, Philadelphia on September 18, 2018 by GEC.